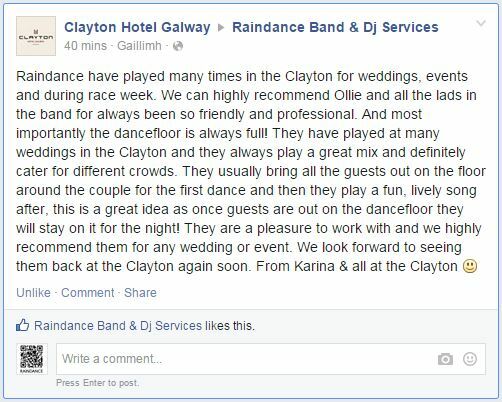 The following are genuine testimonials written by past Brides and Grooms who have had Raindance perform at their weddings, and including testimonials from two professional Wedding Planners working in popular Galway Wedding Hotels… and of course our good friend Jorja below! Ollie and the band were great. Everybody thought that the band was still going, when the DJ had started a half an hour before that. They changed over without anybody even knowing it. I got phone calls and texts afterwards to see who the band were. They were worth every penny and more! All our dealings with Ollie and the band were so professional and no request was too big. The week before our wedding Ollie went through everything with us as to the way the night would unfold. After that we were so relaxed, we had nothing to worry about. On the night of the wedding Ollie and the band played to suit everybody’s taste. We can honestly say there was no stage during the night that the dance floor was not packed. They interacted with the crowd and the transition from the Band to the DJ went so smoothly that people did not realise that the band had even finished. We honestly can’t recommend this band enough. It is three months now since our wedding and people are still talking about Raindance and how good they were. Thanks guys for making our wedding such an enjoyable and memorable night. Mike, Ollie and the band were very professional. No request was too big. In the week leading up to the wedding Ollie sat with us and went through everything in detail. When it came to the big night, the lads played absolutely everything to suit taste of the masses. The dance floor was full from start to finish. We honestly can’t recommend this band enough, and are happy to give you lads a glowing testimonial. Cheers! This is the hardest thing to write, as no words can describe how Raindance made our wedding day so wonderful. Ollie special thanks to you, we felt awkward asking for a song that was not on your set list, but you did such a wonderful rendition of Kenny Rogers “She Believes in Me”. They say two main things make a wedding: the meal, and the band… and I have been told so many people, that our wedding was one of the best they’ve been at in a long time. That is thanks in part to raindance. You made the night such craic, the floor was full all night, the band was just fantastic. Such a talented group of musicians! The transition from band to DJ was unreal, we thought the band was still playing! I couldn’t believe it when I realised the band had finished and the DJ was on. Thank you. Thank you. Thank you!!!! 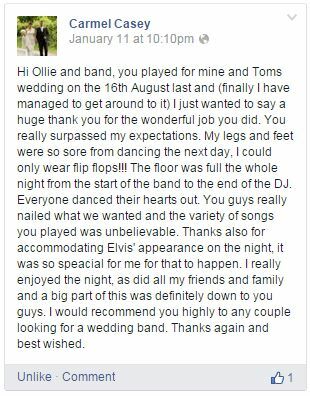 A huge thank you to Ollie and all the band who played at our wedding in the Salthill Hotel in Galway. It was a brilliant night and everyone is talking about how good the band were. The floor was full all night and the crowd really enjoyed the band and the DJ after. The band and the food are the two mains things talked about after a wedding, and all the feedback is excellent for both. Raindance are to thank for that. People continue to ask who the band was. Thanks a million guys for also learning our father daughter dance – that meant a lot to me and it was really nice. We could not recommend Raindance enough, you wont be disappointed. Thanks again guys for making our wedding so enjoyable and one that will be remembered. 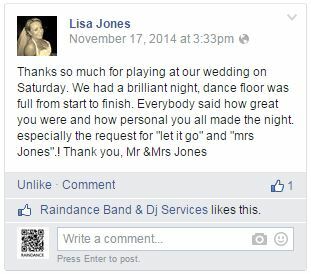 A massive thanks to Raindance for making our wedding reception in the Westwood so lively, though I think the crowd might have had a part in it as they were mad for dancing!!! The fast first dance went down a storm and really set the tone for the night. Who says a first dance has to be slow, romantic and soppy!!! Both old and young – everyone was full of praise for ye! its a pity the night went by so quickly… Keep up the good work lads!